The Pedal matrix is a new feature of the Sonus Paradisi ODFs. 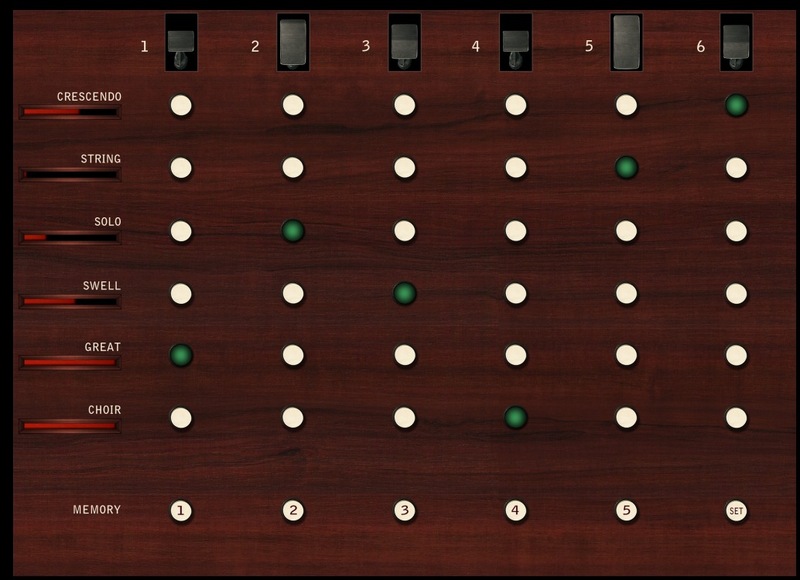 It provides the user with a convenient way of dynamically assigning the physical MIDI continuous controllers (such as balanced swell pedal or a roller crescendo) to the virtual organ controls. The upper row of the pedal matrix presents the balanced pedals. By right clicking, any of pedals can be attached to the desired physical balanced swell pedal of the hardware organ console. When the auto-detect is completed, you should see the pedals in the upper row moving as you move the physical balanced pedal. The next step is routing the movement of the specific pedal to any of the swell boxes (or crescendo device) available in the particular sample set. This is done via the button matrix. In the example below, by clicking the button, the balanced pedal number 1 is wired to the crescendo device of the sample set. 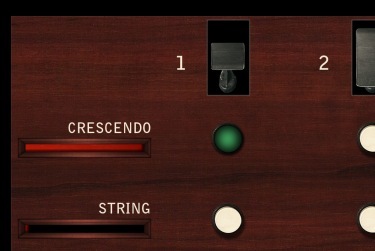 When moving the pedal number 1, you should see also the crescendo indicator moving. Any particular setting of the pedal matrix can be stored into any of the 5 available memories (via the set button) and it can be recalled later. 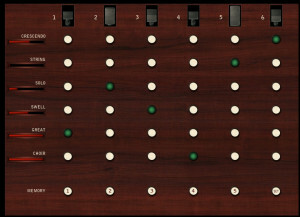 The setting of the pedal matrix is also stored in the Generals. If only limited number of balanced pedals is available on any particular hardware console, it is still possible to manipulate all the swells or crescendos of the sample set by switching between various pedal matrix settings, even during the performance.